It might look like a terrifying vision of the future, but Akrapovic’s robot dyno allows the Slovenian exhaust specialists to test their products in a highly scientific manner. Using human testers in a real-world makes it difficult to continuously log information such as power, torque, air and fuel mixture ratios, back-pressure in various sections of pipe and temperatures. Let alone account for variability in rider input and road and atmospheric conditions. And if a physical failure occurs, it’s not always possible to isolate the specific conditions; you only discover a problem when you come to a stop. This is where Akrapovic’s new durability dyno comes in. Essentially, it’s a rolling road dyno with a robot twisting the throttle via a servo motor, dipping the clutch with its hand and changing gear and applying the rear brake with its feet. Developed by Italian industrial testing specialists Apicom to Akrapovic’s own design, the robot uses Akra’s own in-house-made throttle actuator, together with pneumatic operation for the other controls. All its actions are pre-programmed into the machine from the dyno’s control room, meaning repeatability that they could never get from a bored dyno operator. Akrapovic also hope to rent out the facility to bike manufacturers. Automating the rider opens up a new world of scientific exhaust testing. A ‘riding’ robot means an operator can run any riding simulation, for as long as they want and can monitor and evaluate the bike performance continuously under repeatable running conditions, which will become more important as emissions regulations become more stringent. “Also, you normally have a dyno operator on the bike, which is fine for a rapid turnaround. 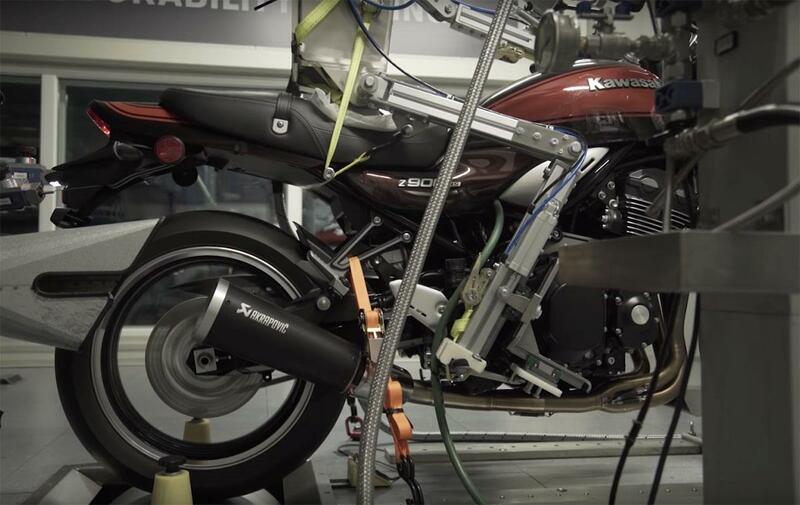 “But the aim of the durability dyno is to allow a duty cycle (a test routine) to be configured to suit the typical use of any type of motorcycle. So, we have a profile for superbikes, a profile for enduro bikes, one for scooters etc. We can even simulate specific race tracks. “Then we take the duty cycle; which is, say, 10 to 20 miles long and repeat it for over 6000 miles (which is extrapolated to represent 25,000 miles on the street), or even more. We have a fuel system supplying the engine continuously and obviously the robot can sit there and ride the bike indefinitely. It can also blast the bike with wind speeds of over 120mph to replicate riding on the road using a ventilation system. When it’s cold, heat from the bike’s engine can be used to heat up the incoming air. Part of the energy needed to run the system is recovered from the bike using a clever 200 kW electric motor in the dyno. 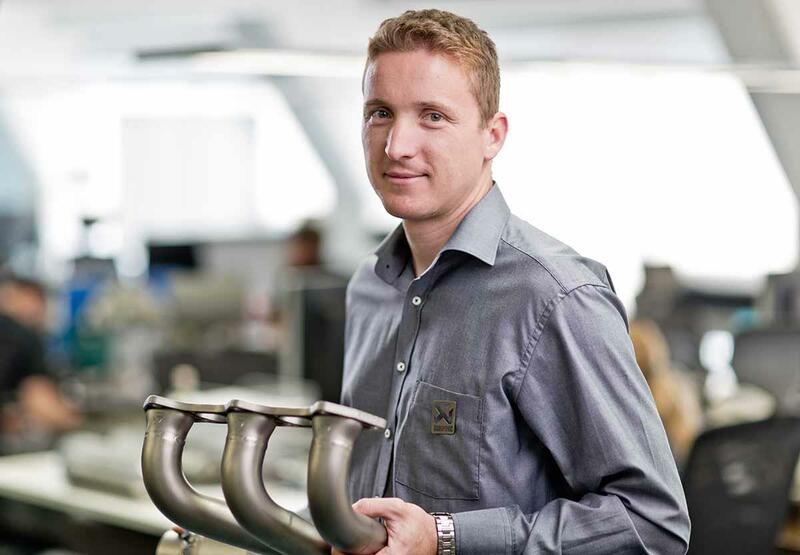 Although the system is clearly state-of-the-art, Akrapovic have no intention of abandoning their human testing programme, valuing "the impressions from a real rider to get the true sensation of every one of its exhausts right," according to their website.